Ah, gentle reader, if you thought that title portended some fascinating bit of travelogue or historical insight, you are sadly mistaken. Alas, it is entirely literal, having to do with where geckos go, and I mean go. OK, it is a small price to pay for mosquito free premises, and gosh they are kind of cute, and how DO they manage to cling to the wall completely horizontal?? But man do they produce poo. And it’s hard and sticky and requires a stiff brush to remove. They travel along walls and seem to favor corners and tight spots as places to leave their mark--no doubt more than you care to know. Here is a photo of the Ship to Nowhere, which parks most nights in the bay across from Miami Beach. 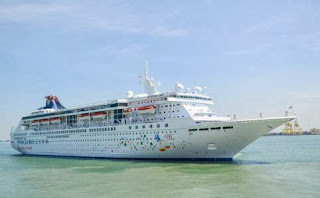 People board it in nearby Georgetown for a one night “cruise” that offers duty free shopping and an onboard casino. Guess that’s what “offshore betting” really means. This week two leather items succumbed: the checkbook cover and a watchband--you just can't leave anything alone unsupervised in a dark spot. T and I climbed Penang Hill a few weeks ago. There is a paved road (with thankfully little traffic) all the way--5 kilometers straight up. The near constant 30 degree incline had us hobbling for days after. Occasionally he has the condo’s 27 meter pool all to himself. Here he is from our balcony. For a well-meaning international effort to raise awareness of men's health issues, many of the male teachers at the International School of Penang cultivate facial hair for the month of November. T and K chaperoned a group of 10 year olds to Langkawi Island-- gorgeous place. Four days with 37 kids--it was actually quite fun, jam packed with activities, including my favorite--the “6-D” ride. kids feeding white bread to an elephant--surely the owner could have found something more nutritious? 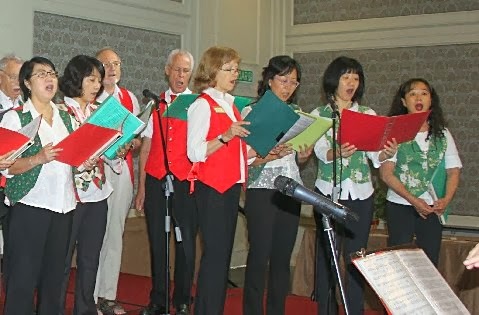 K has had a good time singing Christmas carols with the International Women's Association choir at various places around town. 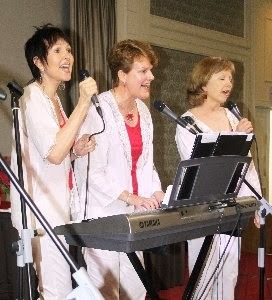 And, in the Incredibly Scary Venture department, she has joined with two other over the hill American ladies to form the Penang Harmony Divas. 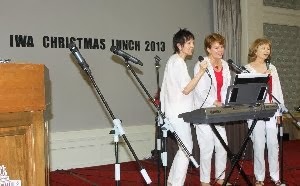 Their second performance, at the IWA Christmas luncheon at the Eastern & Oriental hotel, included four numbers: Bye Bye Love, Let it Shine* (think, Let it Snow; lyrics a joint venture by yours truly and Diva Marlene, below). In My Room, and Santa Baby. It is scary but fun. I should go, I should go, I should go. Think I’ll stay cause Penang’s so much fun.